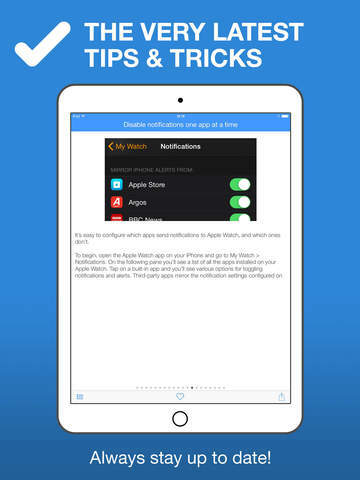 [prMac.com] Poole, United Kingdom - Tap Guides today is proud to announce the release and immediate availability of Tips & Tricks for Apple Watch, a brand-new app for both iPhone and iPad that's packed with amazing tips and knowledge. Priced just $0.99, and available in the App Store, it's the perfect tips app for anyone who wants to make the most of their brand new Apple Watch. Apple Watch is an incredible piece of technology that's packed with amazing features, and made from the most beautiful elements known to man. It also comes with a brand new operating system and the Digital Crown, which means you'll need to learn new tips and tricks before you can make the most of it. Tips & Tricks for Apple Watch is here to help. It's jam-packed with more than 100 helpful tips and tricks that help you to unleash the power of Apple Watch, each with a helpful image and written with concise text. You'll discover everything you need to know about the Apple Watch operating system, its built-in apps, customizations, accessibility features and mush more. Tips & Tricks for Apple Watch 1.0 is only $0.99 USD (or equivalent amount in other currencies) and available worldwide exclusively through the App Store in the Reference/Books category. Promo codes are available on request. Launched in 2015, Tap Guides Ltd publishes eBooks and interactive apps that teach users how to use their iOS devices. Tap Guides most notable book to date is the iPhone 6s Guidebook. Copyright (C) 2015 Tap Guides Ltd. All Rights Reserved. Apple, the Apple logo, iPhone, iPod and iPad are registered trademarks of Apple Inc. in the U.S. and/or other countries. Other trademarks and registered trademarks may be the property of their respective owners.